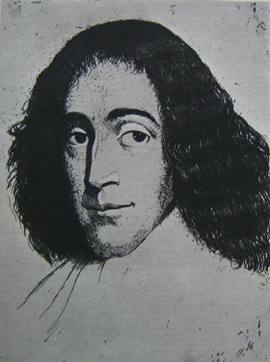 Baruch Spinoza (1632-1677) was among the most important of the post-Cartesian philosophers who flourished in the second half of the 17th century. He made significant contributions in virtually every area of philosophy, and his writings reveal the influence of such divergent sources as Stoicism, Jewish Rationalism, Machiavelli, Hobbes, Descartes, and a variety of heterodox1 religious thinkers of his day. For this reason he is difficult to categorize, though he is usually counted, along with Descartes and Leibniz, as one of the three major Rationalists. Given Spinoza’s devaluation of sense perception as a means of acquiring knowledge, his description of a purely intellectual form of cognition, and his idealization of geometry as a model for philosophy, this categorization is fair. But it should not blind us to the eclecticism of his pursuits, nor to the striking originality of his thought. Among philosophers, Spinoza is best known for (his) Ethics, a monumental work that presents an ethical vision unfolding out of a monistic metaphysics in which God and Nature are identified. God is no longer the transcendent creator of the universe who rules it via providence, but Nature itself, understood as an infinite, necessary, and fully deterministic system of which humans are a part. Humans find happiness only through a rational understanding of this system and their place within it. On account of this and the many other provocative positions he advocates, Spinoza has remained an enormously controversial figure. For many, he is the harbinger of enlightened modernity who calls us to live by the guidance of reason. For others, he is the enemy of the traditions that sustain us and the denier of what is noble within us. After a review of Spinoza’s life and works, this profile reviews the main themes of his philosophy, primarily as they are set forth in Ethics. Spinoza came into the world a Jew. Born in 1632, he was the son of Marrano parents. They had immigrated to Amsterdam from Portugal in order to escape the Inquisition that had spread across the Iberian Peninsula and live in the relatively tolerant atmosphere of Holland. Spinoza’s father, Michael, was a successful merchant and a respected member of the community. His mother, Hanna, the second of Michael’s three wives, died in 1638, just before Spinoza was to turn six. The young Spinoza, given the name Baruch, was educated in his congregation’s academy, the Talmud Torah (school). There he received the kind of education that the community deemed necessary to constitute one as an educated Jew. This largely consisted of religious study, including instruction in Hebrew, liturgy, Torah, prophetic writings, and rabbinical commentaries. Although Spinoza no doubt excelled in these, he did not move on to the higher levels of study which focused on the Talmud and were typically undertaken by those preparing for the rabbinate. Whether by desire or by necessity, Spinoza left the school in order to work in his father’s business, which he eventually took over with his half-brother, Gabriel. 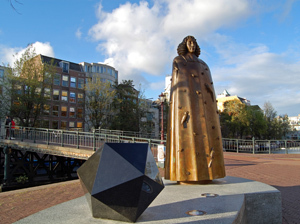 The Jewish community in Amsterdam was by no means a closed one, but Spinoza’s commercial activities put him in touch with more diverse currents of thought than those to which he had been exposed. Most significantly, he came into contact with so-called ‘free-thinking’ Protestants – dissenters from the dominant Calvinism – who maintained a lively interest in a wide range of theological issues, as well as in the latest developments in philosophy and science. This naturally included the work of Descartes, which was regarded by many in Holland to be the most promising of several alternatives to scholasticism that had emerged in recent decades. In order to discuss their interests, these free-thinkers organized themselves into small groups, they called colleges, which met on a regular basis. Spinoza may have attended such meetings as early as the first half of the 1650′s, and it is most likely here that he received his first exposure to Cartesian thought. This is not to say that Spinoza ceased to mine the resources of his own tradition – he became steeped, for example, in the writings of such philosophically important figures as Maimonides and Gersonides – but his intellectual horizons were expanding and he was experiencing a restlessness that drove him to look further afield. It was at this time that he placed himself under the tutelage of an ex-Jesuit, Franciscus Van den Enden, who had recently set up a Latin school in Amsterdam. Van den Enden turned out to be the perfect teacher for Spinoza. In addition to having an excellent reputation as a Latinist, he was a medical doctor who kept abreast of all that was new in the sciences. He was also notorious for his allegedly irreligious cast of mind, and he was a passionate advocate of democratic political ideals. Spinoza’s intellectual reorientation came at a cost. His increasingly unorthodox views and laxity in his observance of the Jewish law strained his relations with the community. Tensions became so great that, in 1656, the elders of the synagogue undertook proceedings to excommunicate him. Without providing details, the formal written order (writ) of excommunication accuses him of abominable heresies and monstrous deeds. It then levels a series of curses against him and prohibits others from communicating with him, doing business with him, reading anything he might write, or even coming into close proximity with him. Spinoza may still have been a Jew, but he was now an outcast. Little is known about Spinoza’s activities in the years immediately following his excommunication. He continued his studies with Van den Enden and occasionally took up residence in his teacher’s home. As it was now impossible for him to carry on in commerce, it was most likely at this time that he took up lens grinding as an occupation. There is also evidence that he traveled periodically to Leiden to study at the university. There he would have received formal instruction in Cartesian philosophy and become familiar with the work of prominent Dutch Cartesians. In 1661, he settled near Leiden, in the town of Rijnsburg. It was during this same period (in the late 1650s) that Spinoza embarked upon his literary career. His first work, the Treatise on the Emendation of the Intellect, is an attempt to formulate a philosophical method that would allow the mind to form the clear and distinct ideas that are necessary for its perfection. It contains, in addition, reflection upon the various kinds of knowledge, an extended treatment of definition, and a lengthy analysis of the nature and causes of doubt. For reasons that are unknown, the Treatise was left unfinished, though it appears that Spinoza always intended to complete it. Shortly thereafter, while in Rijnsburg, Spinoza set to work on his Short Treatise on God, Man, and His Well-Being. This work, circulated privately among friends, foreshadows many of the themes of his mature work, Ethics. Most notably, it contains an unambiguous statement of the most famous of Spinoza’s theses – the identity of God and Nature. Spinoza’s stay in Rijnsburg was brief. In 1663 he moved to the town of Voorburg, not far from The Hague, where he settled into a quiet, but busy, life. At the behest of friends, he immediately set about preparing for publication a set of lessons that he had given to a student in Leiden on Descartes’s Principles of Philosophy. The result was the only work that he was to publish under his own name, now Latinized to Benedict: René Descartes’s Principles of Philosophy, Parts I and II, Demonstrated According to the Geometric Method by Benedict de Spinoza of Amsterdam. 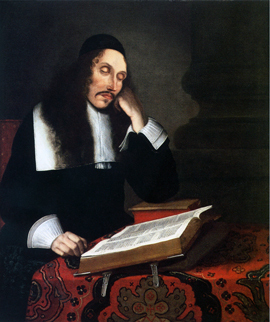 As a condition of publication, Spinoza had his friend, Lodewijk Meyer, write a preface to the work, warning the reader that his aim was exposition only and that he did not endorse all of Descartes’s conclusions. He also appended a short piece, entitled Metaphysical Thoughts, in which he sketched some of his own views. Despite his admiration for Descartes, Spinoza did not want to be seen as a Cartesian. Upon opening Spinoza’s masterpiece -- Ethics -- one is immediately struck by its form. It is written in the style of a geometrical treatise, much like Euclid’s Elements, with each book comprising a set of definitions, axioms, propositions, scholia, and other features that make up the formal apparatus of geometry. One wonders why Spinoza would have employed this mode of presentation. The effort it required must have been enormous, and the result is a work that only the most dedicated of readers can make their way through. Some of this is explained by the fact that the seventeenth century was a time in which geometry was enjoying a resurgence of interest and was held in extraordinarily high esteem, especially within the intellectual circles in which Spinoza moved. We may add to this the fact that Spinoza, though not a Cartesian, was an avid student of Descartes’s works. As is well known, Descartes was the leading advocate of the use of geometric methods within philosophy, and his Meditations was written more geometrico, in the geometrical style. In this respect Ethics can be said to be Cartesian in inspiration. While this characterization is true, it needs qualification. Meditations and Ethics are very different works, not just in substance, but also in style. In order to understand this difference one must take into account the distinction between two types of geometrical methods -- the analytic and the synthetic. With this distinction between adequate and inadequate perception in place, Spinoza introduces a set of further distinctions. He begins with inadequate perception, which he now calls knowledge of the first kind, and divides it into two parts. The first consists of knowledge from random experience -- experientia vaga. This is knowledge from singular things which have been represented to us through the senses in a way which is mutilated, confused, and without order for the intellect. The second consists of knowledge from signs -- ex signis. For example, from the fact that, having heard or read certain words, we recollect things, and form certain ideas of them, like those through which we imagine the things. What links both of these forms of knowledge is that they lack a rational order. It is obvious that knowledge from random experience follows the order of the affections of the human body, but so does knowledge from signs. A Roman who hears the word pomum, for instance, will think of an apple, not because there is any rational connection between the word and the object, but only because they have been associated in his or her experience. When we reach what Spinoza calls the second kind of knowledge, reason (ratio), we have ascended from an inadequate to an adequate perception of things. This type of knowledge is gained from the fact that we have common notions and adequate ideas of the properties of things. What Spinoza has in mind here is what was just indicated -- namely, the formation of adequate ideas of the common properties of things and the movement by way of deductive inference to the formation of adequate ideas of other common properties. Unlike in the case of knowledge of the first kind, this order of ideas is rational. If the way I have shown to lead to these things now seems very hard, still, it can be found. And of course, what is found so rarely must be hard. For if salvation were at hand, and could be found without great effort, how could nearly everyone neglect it? But all things excellent are as difficult as they are rare. 2Marranos were originally Jews living in the Iberian Peninsula who converted or were forced to convert to Christianity, some of whom may have continued to practice Judaism in secret. The term came into later use in 1492 with the Castilian Alhambra Decree, reversing protections originally in the Treaty of Granada (1491).